Hi! My name is Rick Spears and I have been drawing and sculpting for as long as I can remember. Maybe even before that. My work is representational and usually within the realm of Natural History. You know how most little kids go through a dinosaur phase? Well, I never grew out of mine. I don't know what it is about dinosaurs that I find so fascinating, but do I ever! I really enjoy drawing and making models of prehistoric creatures as they may have looked in life. 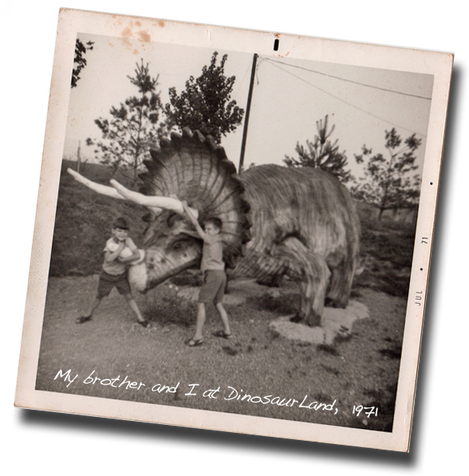 No matter how much one can glean from the fossil record, there is still a lot of guesswork involved in making restorations of extinct animals. I also like cryptozoology: the study of "hidden animals" such as Bigfoot or the Loch Ness Monster. Again, maybe the attraction comes from piecing together what is known about a mysterious animal, then adding one's own speculative scientific plausibility, or SSP*, to create an image of said animal.